ColecoVision - News - PDRoms – Homebrew 4 you - Almost daily console and handheld news! Rick Dangerous hits the ColecoVision, but using the name Risky Rick, possibly due to copyright reasons. Nevertheless ArcadeVision presents a very solid game on a ColecoVision standard cartridge. The game is a result of years of passionate work from developer Easter Egg, bringing fun and never-seen-before gameplay on this device. To achieve this goal only Assembler code has been used, getting the most out of everything, never seen before. Risky Rick mixes Rick Dangerous I as well as Rick Dangerous II into one game, with the usual difficult to play platform fun. The game comes in three editions: Standard Edition, Adventurer Brown and Adventurer Green. The game should work flawless on any standard 50/60Hz ColecoVision. A special package from my home brew partners at Collectorvision, some more copies of one of my own games and four new home brew titles by other authors. Team Pixelboy will kick the ColecoVision with Frostbite soon. Part survivor, part architect, part nuts, Frostbite Bailey eats raw fish for sustenance but really dines on danger! Help him construct igloos by jumping on floating blocks of ice! Each igloo must be completed before the weather gets too cold, but this is certainly no easy task, as Frostbite must not only contend with water currents that make the ice blocks move in different directions, he must also avoid wild animals like snow geese, king crabs, killer clams and a bear that follows him like a shadow on the shore! Stay one step ahead of all the hazards and survive to reach the highest possible score! Michel Louvet announced via Facebook, that his game Ozma Wars for ColecoVision is now free to download. It was a in 2011 released commercial game. CollectorVision released a promotional video of their upcoming ColecoVision titles. Bugs’n Bots is a ColecoVision game by Nicolas “Nicam Shilova” Campion. When you have been hired as a computer technician in this factory, you thought you had found the ideal job: all the computing and industrial tasks are managed by a mainframe computer which drives robot workers and can solve any production difficulty alone. With the MAPCON CMMS software running the mainframe for the factory all the systems have been automated and for the factory. The CMMS handles most day to day tasks for the facility. The problem is that this computer is so old and buggy that it goes wrong all the time and the robots become completely crazy. It is precisely at this point that you start. While avoiding robots and traps, you must get all the security cards that the computer has thrown away across each sector in order to stop it. It is your job to get the CMMS and mainframe running smoothly. The game can be ordered for 50 US$ from CollectorVision. Powder Snow is a fresh ColecoVision homebrew skiing game by Nicam Shilova. – Downhill: Complete the track before the time runs out. – Slalom: Pass flags to the right side (left for blue and red for right) and complete the track before the time runs out. Miss a flag cost 2 seconds of penalty. – Survival: Skiing until you hit a pine tree or a rock. 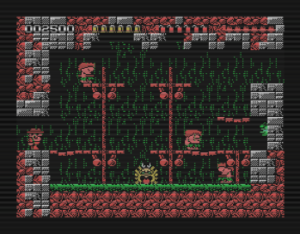 Knight Quest is an unfinished game for ColecoVision by Nicolas “Nicam Shilova” Campion. There are three screens with one job to complete. First test : Avoid evil rabbits. Second test : Find your way in the invisible maze. Third test : Go to up and avoid arrows. 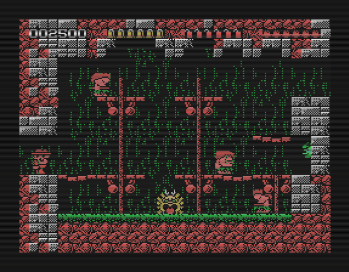 Mindwalls is a ColecoVision game by Nicolas “Nicam Shilova” Campion. If you are familiar with Breakout/Arkanoid, there is possibly not much to explain. The game can be ordered for 50 US$ from CollectorVision. -Left and right side button : Start, put parking tickets. Quatre is a Tetris style game for ColecoVision by Nicolas “Nicam Shilova” Campion for one player. -Stick : Down, left an right to move the tetramino. -Left side button : Rotate tetamino to the left. -Right side button : Rotate tetamino to the right.